Attribution Reporting will enable your organization to connect Marketing investments with revenue outcomes, fundamentally changing how Marketing is perceived and measured at the executive level. 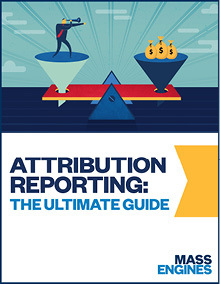 To transform your marketing with this powerful reporting system, download our eBook, Attribution Reporting: The Ultimate Guide. Business Email Please enter a valid business email address. ©2019 MASS Engines. All rights Reserved.